While working on a virtual house experience in VR, our client asked if we can add a virtual family. A father, late for work and running hastily through the front door. His wife, having her glass of wine on the sofa at night. The kids, fooling around in the garden. Yes, this can be done. But apart from creating the 3D avatars, it will take at least a week to animate them. That was before we started using motion capture. Now we can create these animations this within a day. Thanks to motion capture. For the impatient: here's a quick link to our showcase of motion captured projects. Two years ago we ordered the ROKOKO Smartsuit Pro, a motion capture suit that's completely wireless and markerless. Perfect to use on any location: behind our desk, in our studio, on a film set. It requires some time to get the most out of it, but soon it becomes a real blast to create humanoid animations. And it's a huge time saver. With motion capture, we believe we can deliver effective and cheap animations, tailored for a fast-paced market. The animation will not reach the level of detail like you would expect in a blockbuster movie, but it will be perfect for telling your story. 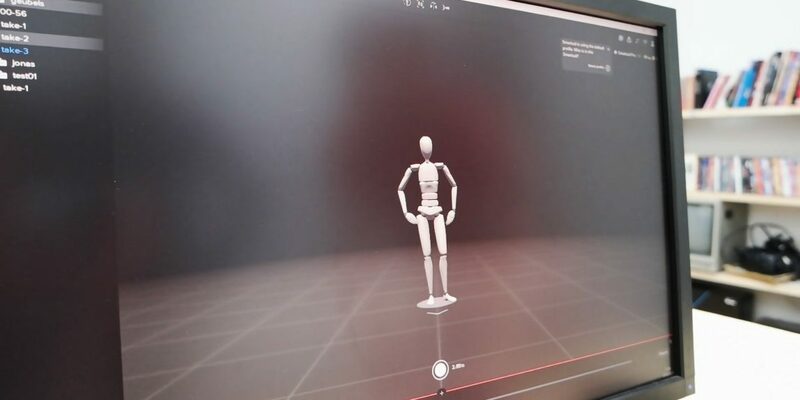 If you're doing previz for a movie, animations for in-game cinematics, an explainer video on how to work-out, … this suit will give you new opportunities to bring a character to the screen. Jelle Vandewiele graduated at School of Arts in Ghent as master in Media Art. For his graduation project, he created a self portrait game that gives you a notion of who he is. He recreated 3d environments from his memories and throughout the game you discover fragments of his life that shaped him. The motion capture suit was used to catch the dance moves. They had their own style and the name of his YouTube account says it all: Funky Legz. Winter was upon us. We came in early in the morning, grabbed a coffee and wrote a little speech. After some quick scene building in Unity, we put on the motion capture suit and become Santa. Eight hours later, we published this social media post. GEUB is a eight-part comedy television series, in which stand-up comedian Philippe Geubels plays a version of his dead-normal self in a dead-normal universe. The humor comes from the situations, the secondary characters but especially from the comic precision work of Philippe. Together with VC Studios, we recreated the movement of an actor who was playing a character that's experiencing VR and mocap for the first time. Sorry if we lost you. Watch the trailer below (Flemish / Dutch). In the future we will release a making-of. Feel free to get in touch. Everyone's welcome to drop by and experience the Holofarm.